NuMedica NAC (N-Acetyl Cysteine) is a type of amino acid called l-cysteine. This supplement works as a very powerful free radical. Free radicals like this work in the body to remove toxins and other components within the body that can lead to illness and disease. NuMedica NAC works as a preventative tool and supports tissue levels of glutathione (known as GSH) as a way of defending the body from reactive oxygen species (known as ROS). It also works to protect the body from detoxification from drugs, compounds of all types including metabolites. NuMedica NAC can specifically help to support healthy lung function. NuMedica NAC provides 600 mg tablets of this high quality nutrient necessary for overall body health and detoxification. NuMedica is a leading provider of natural supplements that are on the cutting edge of today's effective products. Often considered the benchmark by which other supplements are compared, NuMedica's products are designed to provide the highest level of effectiveness to the user for optimum health. The key ingredient in NuMedica NAC is L-cysteine. This is a type of proteinogenic amino acid and it contributes directly to the building of protein. It also includes the element sulphur. The body is capable of synthesizing l-cysteine in the liver, which is why it is not an essential amino acid. However, supplementation of this product is often necessary to meet the body's needs at the highest level. Outside the body, this amino acid is found in a small number of proteins in the diet. L-cysteine works to detoxify the body form high levels of sulphuric acid. It also works to protect the body's cells from free radicals, the toxins known to cause heart disease, cancers, and other diseases in the body. In addition, it works to contribute to building glutathione in the body, which is the largest antioxidant in the body. For all of these reasons, supplementing the body's supply of this nutrient is often necessary to ensure proper cell protection. 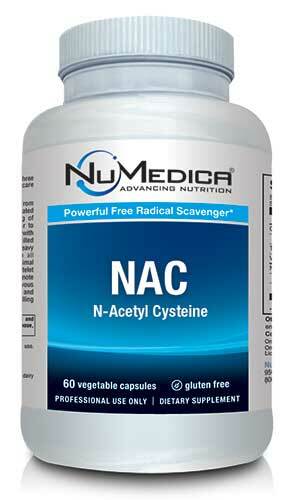 NAC (N-Acetyl Cysteine) - 60c 1 Capsule 60 Take one capsule twice daily between meals or as directed by your healthcare practitioner. NAC (N-Acetyl Cysteine) - 120c 1 Capsule 120 Take one capsule twice daily between meals or as directed by your healthcare practitioner.